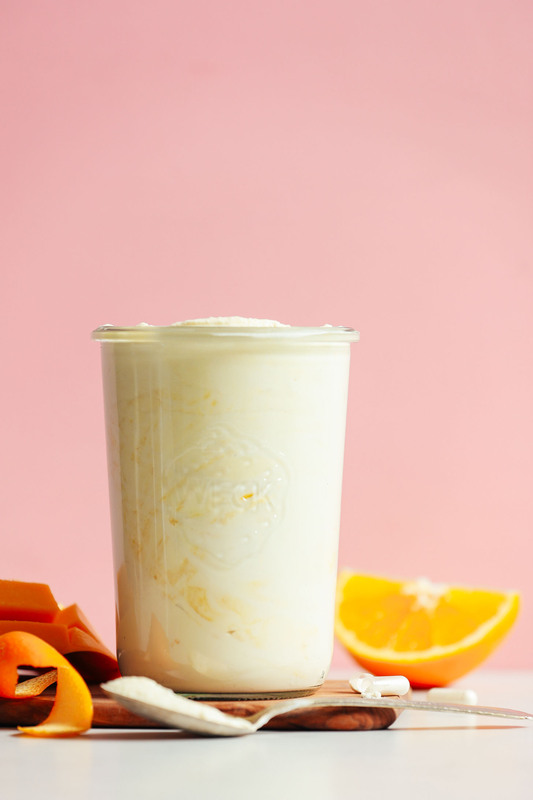 If you want delicious mango coconut yogurt but don’t want to pay $25* for it, this is the recipe for you. 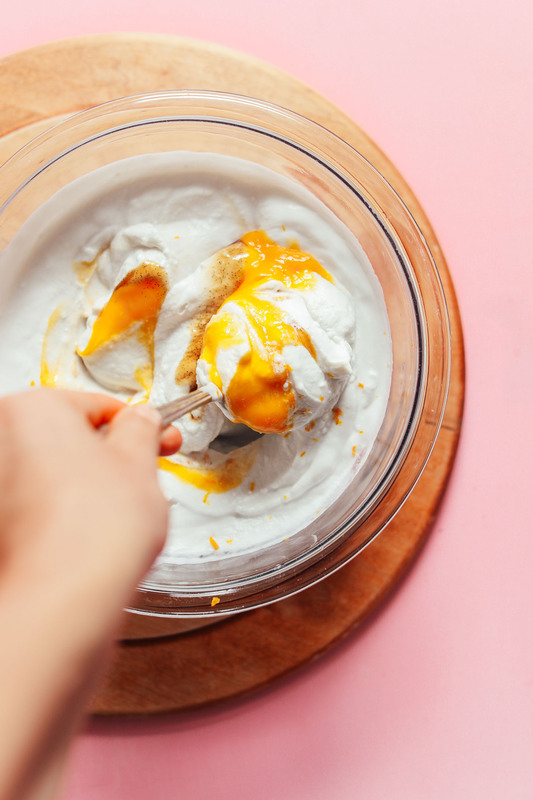 Consider this a fun spin on our 2-Ingredient Coconut Yogurt to include mango and orange for a thick, tangy, creamy yogurt infused with delicious fruit and vanilla flavor. Serious swoon. Let’s do this! 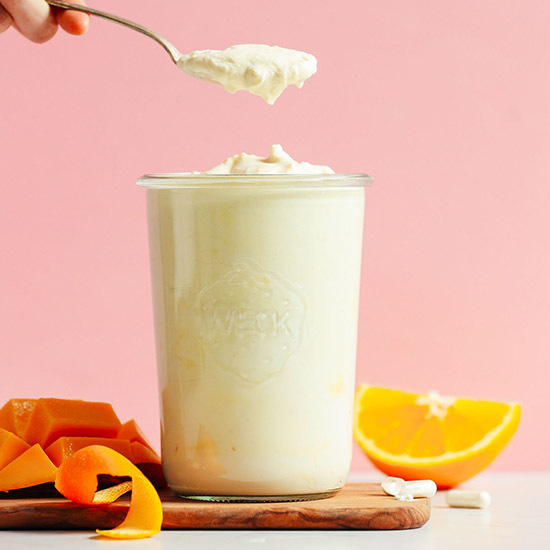 The base of this 5-ingredient recipe starts with full-fat coconut milk and probiotic pills (brand recommendations for both below!). Once mixed together, let it hang out at room temperature until thick and tangy – about 48 hours seems to be the sweet spot for us. Once thickened, it’s time to add the flavor! We loved a dash of vanilla extract (or paste), mango purée, and orange zest or juice. Once refrigerated, the yogurt will become even thicker and richer in flavor – this is key! Real talk: The reason Coconut Cult yogurt costs so much is each 16-ounce jar contains 800 billion active probiotic cultures (some of which are human-derived). That’s a lot! Depending on the brand and quality of probiotic you add, you can get up to that number. But we think anything above 10 billion active cultures is pretty dang awesome (the one we use contains 50 billion). With that said, the cost comparison of 1 16-ounce jar Coconut Cult vs 1 16-ounce jar of our recipe is $24.50 vs. $6.48* (that’s a cost savings of $18.02!). 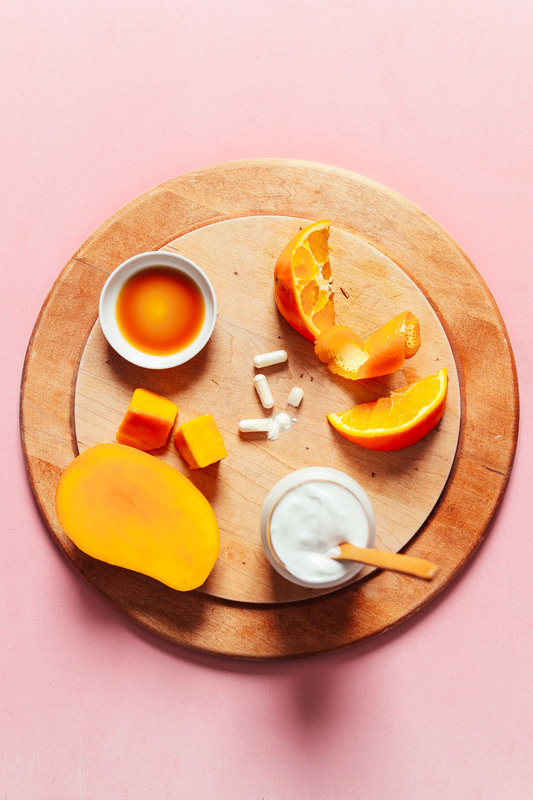 *This cost estimation is for 1 can Whole Foods 365 full-fat coconut milk, 1 1/2 Renew Life 50 billion probiotic capsules, 1/2 mango, 1/2 orange, and a dash of vanilla. That means you have the same amount of delicious, tangy yogurt for a fraction of the cost. Pretty cool, huh? P.S. For more yogurt troubleshooting tips, see our original post for 2-Ingredient Coconut Yogurt. This yogurt is tasty on its own, but it’s also delicious when added to things like our Coconut Yogurt Cheesecake, Raw Banana Splits, Coconut Yogurt Waffles, or this Caramel Apple Cheesecake Tart! 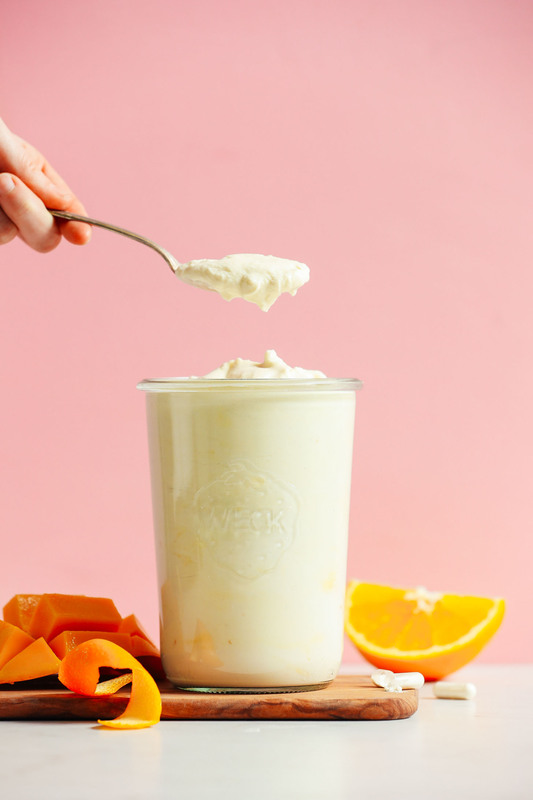 Tangy, mango-infused coconut yogurt that tastes like Coconut Cult! Made with 5 simple ingredients and simple methods. Super thick, creamy, and delicious! It’s important to select a coconut milk that’s creamy and smooth (not grainy or clumpy) to ensure that the yogurt is creamy and smooth. My favorite brands are: Whole Foods 365 full-fat (BPA-free), Aroy-D full-fat, and Thai Kitchen full-fat. Native Forest (BPA-free) isn’t as creamy, but it still makes tasty yogurt. I would not recommend Trader Joe’s (BPA-free), which was recently reformulated and is now chunky/grainy. The recommended brands’ full-fat coconut milks (and coconut cream) also work well for coconut whipped cream! For best results, I recommend using Whole Foods 365 for achieving the creamiest and thickest yogurt. Shake your coconut milk can well. Then open and pour into a clean (sterilized), dry glass jar or bowl. I like this one from Weck. Often the coconut milk is separated, so whisk it to get it completely smooth. Empty your probiotic capsules (see brand recommendations below) into the yogurt and (important:) use a wooden or plastic spoon to stir, not metal, as a metal spoon can react negatively with the probiotics. Stir until creamy and smooth, pushing the probiotic up against the side with your spoon to evenly disperse. Cover the mixture with cheesecloth (or a very thin, clean dish towel – something that lets air in but keeps bugs out) and secure with a rubber band. Let the yogurt activate for at least 24 hours and up to 48 hours (sometimes longer – 48 hours is my sweet spot for thickness and tang) in a warm place. The longer it rests, the tangier the yogurt will become. In warmer climates and summer, it’s easy to make yogurt if your house is warm (75 degrees F / 23 C and above). But in cooler climates or seasons, place the yogurt in the oven with the light on (do not turn on the oven), where it should have the right amount of heat to activate. Once the yogurt has reached the right amount of tanginess and thickness for your liking (be sure to sample with a wooden spoon), cover securely with a lid and refrigerate until cold. Refrigerating will also thicken the yogurt even more, almost to a Greek yogurt consistency (depending on the brand of coconut milk you used)! NOTE: For even thicker yogurt, line a fine mesh strainer with two layers of cheesecloth and set over a mixing bowl. Pour in the yogurt, loosely cover with a lid or plastic wrap, and let rest in the refrigerator overnight or for 12+ hours. It should thicken up quite a bit more as as any excess liquid strains to the bottom. Enjoy immediately or place back in refrigerator to thicken for at least 4-6 hours (which we prefer). Store covered in the refrigerator for several days (mine kept for 7 days). You’ll know it’s gone bad when the smell is off-putting or there is mold. For more troubleshooting tips, check out our original 2-Ingredient Coconut Yogurt post! *I also had mild success with the Aroy-D full-fat coconut milk and cream but found that it separated a little, which the Whole Foods 365 brand does not do. For this reason, I highly recommend sticking with the Whole Foods brand. *My go-to probiotic is Renew Life Ultimate Flora 50 billion. However, the company does not confirm whether or not it is vegan. So a good vegan option is Jarrow Probiotic 10 billion, which I tested with the yogurt and it worked well! 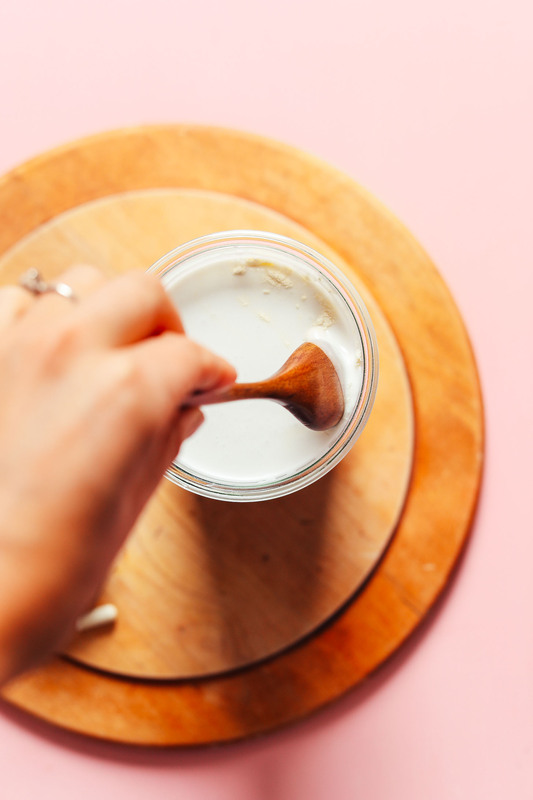 Keep in mind, one bottle of probiotics can not only be used to make dozens of batches of yogurt, but it can also be taken orally for good digestive health, so it’s worth the investment. *Please make sure your probiotic is high quality and does not contain PREbiotics or the yogurt will not work.The combination I have had the most success with: 1 can 365 Whole Foods Full-Fat Coconut Milk + 2 Renew Life 50 billion probiotic capsules. *Nutrition information is a rough estimate for 1/4 cup of 12 total servings using full-fat coconut milk. *I have not tested this recipe in a yogurt maker or with a yogurt starter/culture. So if you try them this way, let us know how it goes in the comments! *It’s important that you follow the recommendations of coconut milk brands I mention. Otherwise, we can’t guarantee good results. I believe Whole Foods 365 brand works so well because the flavor and consistency are nearly perfect. It does contain guar gum, which may be why it helps create a smooth texture and prevents separation. Brands that do not contain guar gum are more likely to have some separation. *If you have separation, that’s OK! Either stir it in, or put it in the refrigerator separated, scoop off the creamy top layer, and discard any liquid. *If your yogurt takes on weird colors or odd smells, something has gone wrong. This never happened to us, but it can. If this happens, throw it out! It should taste tangy but not spoiled or putrid. *If you made this recipe with good results and you tried other brands / methods, please leave a rating and share any tips or tricks that might be useful to other readers! *I have not tested this recipe with any other non-dairy milks and have no further recommendations besides full-fat coconut milk. *Lastly, if you want to thicken your yogurt even more, place two layers of cheesecloth over a fine mesh strainer set over a large mixing bowl and carefully pour in your yogurt. Then loosely cover the top (with a lid or plastic wrap), and refrigerate / let drain for several hours (draining liquid as needed) until desired thickness is reached!